Android Joins The myBeat Party! While all you RunRockers have been lacing up to hit the gym and rock the roads, the RockMyRun team has been working around the clock to update the Android app! We’ve added our myBeat technology, incorporated new features, revamped the design and added cleaner navigation. So before you head out the door for your next run, make sure to update your app (or download it here!) in order to get access to these exciting changes. We’re excited to announce that that our myBeat™ technology has been added to the Android app! The myBeat™ feature allows our members to edit the beats per minute (BPM) of downloaded mixes, in order to personalize and enhance their workout experience. Basically, myBeat™ will let you sync music to your body and enables you to take your training to a whole new level! Pretty cool, huh? We know how it is—one day you’re feeling bubbly and bopping to our Pure Power Pop mix, and the next, you’re having a bad day and running angry to our Metal Mayhem mix. 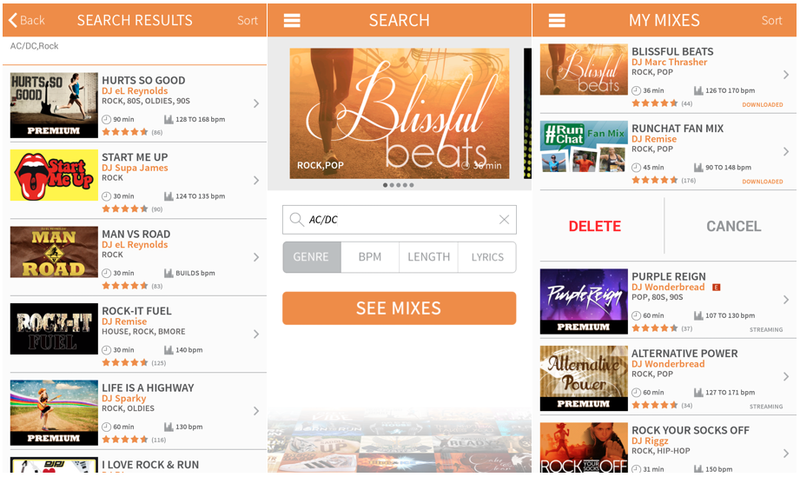 Next thing you know, you have so many mixes in your RockMyRun app it’s hard to keep track! Lucky for you, we’ve added mix management features to the app to help. You are now given the option to sort mixes by any of the following mix features: popularity, rating, length, BPM, DJ name, date or alphabetical. Additionally, we’ve added a simple way to delete mixes you no longer want on your phone. Simply swipe left over a specific mix in the MyMixes section, and you have the option to delete. Lastly, we’ve updated and freshened up the app design. Check out the pictures below for a sneak peak! This updated design and user interface will make discovering, downloading and listening to mixes even easier. Well, enough reading. Time for YOU to get running to the beat! Check out myBeat and the updated app, and let us know what you think! This is so awesome! !! Thank you for the updates- I have been waiting for you to do exactly that! Thank you! !